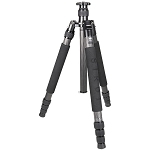 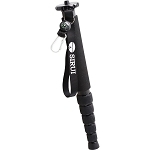 The black T-005SK T-0S Series Travel Tripod with B-00 Ball Head is a 5-section support with aluminum legs that extend, along with the 2-stage rapid center column, by unlocking each twist lock section. 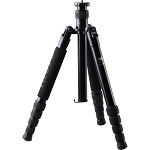 Therefore, the tripod can reach a maximum height of 53.8". 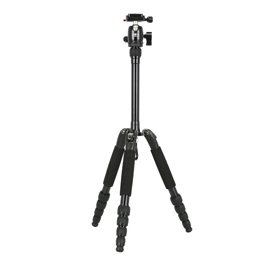 With three variable leg angles, independent leg spread, and the removable center column, the legs can completely splay out to have a minimum height 3.1". To store or carry the 2 lb tripod, the legs fold 180° to produce a compact 12.2" support. 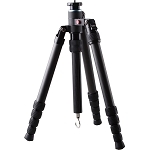 The tripod is capable of supporting a camera and lens that weigh up to 11 lb, and the magnesium-alloy spider has an integrated bubble level to level out your horizon. 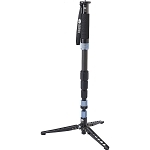 The B-00 Arca-type compatible head is included with the tripod.